Once you decide on an eForm for your study, you will need to make a small adjustment to its properties to tell it to collect data in an anonymized study format. In the Ocean Studies tab, when you are creating a New Study, you may note that only a small subset of the available forms in the Ocean library is included in the list. These are the forms that have been cleared for use within an Ocean Study. Most eForms in the library have been marked as OK for clinical use, but not for studies. However, you can take any eForm, including the custom ones that you have designed, and mark it for study inclusion. You can do this by updating its Data Security Mode setting. Note: Before you mark enable a form for use within a study, please ensure that there are no copyright or usage restrictions that would prevent its use or incur a licensing fee when used for clinical research AND there are no fields in the eForm, such as a phone number, name, or other patient health identifiers (PHI), that would compromise the anonymity of the data. Follow the steps below to learn how to enable an eForm for use in a study. Access your form's eForm Properties. 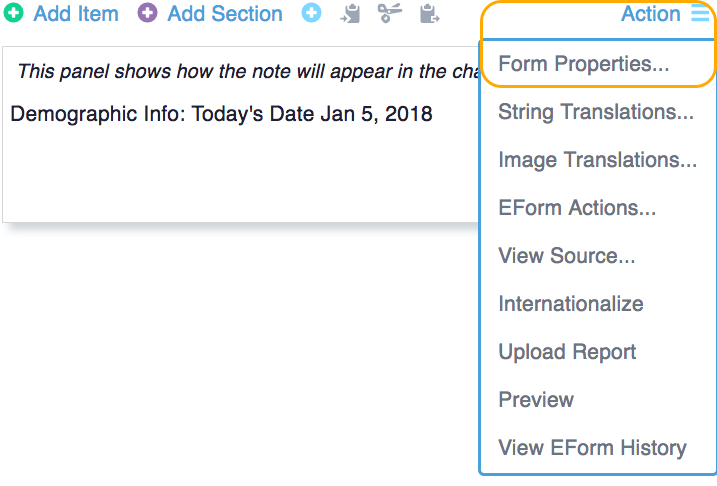 Open the form in the eForm Editor. Choose "Form Properties" from the Action Menu. Select a Data Security Mode. Stores form answers as an encrypted note for EMR clinical storage. These forms will not include their data within an Ocean Study. Most clinical forms use this setting. Select the "an encrypted clinical note" checkbox. Stores form answers only as anonymous structured data within Ocean within an Ocean Study. This will NOT generate a clinical note. For example, this is ideal for a patient satisfaction study, where the clinician should not be able to see the patient's private answers. Select the "anonymous Ocean Study data" checkbox. Stores form answers as both encrypted clinical notes within the EMR, as well as anonymous structured data within an Ocean study. This is ideal for research studies that not only collect data for the study, but also generate useful clinical data for the clinician. For example, an asthma control study may provide useful information for the family physician. Select both the "an encrypted clinical note" and "anonymous Ocean Study data" checkboxes. Note: If you choose the Clinical or Hybrid mode, please ensure the presentation of the note to the clinician meets ethics approval for the study. Click "OK" to exit out of the "Form Properties" window. Ensure that you click the "Save Changes" at the bottom right corner to prevent your changes from being lost. Your eForm should now be visible in the list of eForms shown when creating a new study.